A relaxing week of easy and moderate graded walks based in the charming Alpine village of Alpbach. Voted as Austria's prettiest village, it is the picture-perfect image of the Tyrol with well-kept chalets, flower-filled window boxes and views of the whole valley. Enjoy walks through forests and meadows and ascend the higher ridges by cable car for fantastic mountain views. Arriving at the joining point, Terminal 2 Arrivals Hall Munich Airport, we transfer in 2- 2.5 hours to our accommodation in Alpbach (975m). There are great views of the Alpbach Valley and the surrounding hill-tops, including the imposing Gratlspitz mountain. Alpbach has restaurants, cafés and bars, an ATM and a medium-sized supermarket. There will be a short briefing by our Explore Leader about the week ahead, followed by dinner at a local restaurant. Voted Austria's prettiest village, Alpbach is the picture-perfect image of the Tyrol. The village has well-kept chalets, flower-filled window boxes and views of the whole valley. We walk from the hotel, along the Muehlbachweg and on to Inneralpbach. The first day's walk is a gentle valley walk and an introduction to the area. We will pass by the main river, through larch forests and farm land. From Inneralpbach we take the public bus back to Alpbach. Today's 13-16 kilometre walk is expected to take approximately four hours with an ascent of 325m. We take a 5 minute bus ride from Alpbach and then a cable car to 1850m. This takes us high without the effort of a huge climb! We traverse for 45-60 mins below the Wiedersbergerhorn - the main peak above Alpbach - until we meet the main north-south ridge which undulates at an altitude of around 2100m. We follow the ridge south for 1.5hrs with great views of the valleys of Alpbachtal and Zillital. We can see snow-capped peaks in the distance and the higher peaks above Alpbach. Stopping for lunch, there is the option to climb Standkopf (summit 2241m). It is slightly exposed, but the 45 minute round trip is well worth the climb. We then return along the ridge to the cable car and descend to the valley bottom. For those with the energy you can climb the Wiedersbergerhorn (summit 2127m) - allow 30 mins extra - before taking the lift down. Today's 16 kilometre walk is expected to take approximately five hours with an ascent of 250m and a descent of 250m. We take the public bus to Brandenberg from where it's a short decent to the Tiefenbachklamm. From here we follow the river - Brandenberger Ache - for about 12km on a path through the forest. This is a lovely walk that finishes at Kramsach. From here we catch the bus and return to the hotel. Today's 12 kilometre walk is expected to take approximately five hours with an descent of 350m. We take a five minute bus ride from town and take the Wiedersbergerhorn cable car to 1850m. We follow the path on the west side of the Wiedersbergerhorn and head down towards a lovely small hill called Loderstein (1830m). We then head into the forest and continue descending on the path weaving our way through the pine trees. Eventually we come to a forest track and follow it to a pretty church tucked amongst the hills (3 hours from the top of the cable car). Once here, you can either take the cable car down from Reith Kogel or walk down which takes 90 minutes more. We end our walk in Reith - a small, sleepy town where we can take a drink before heading back to Alpbach on the bus. Today's 14 kilometre walk is expected to take approximately four hours with a descent of 1213m (or six kilometres with a descent of 650m if you take the cable car to Reith). A free day to explore the region on your own using public transport. Options include a trip to Innsbruck with historic buildings, churches, museums and lots of restaurants and cafés. Rattenburg is a historic town famous for its glassblowing and easily reached by public bus. Or you could head to Achensee - a beautiful lake, surrounded by mountains. You can swim at the lake or explore some of the small villages. If there are enough people interested, a private minibus can be hired for a day-trip to Salzburg for your Sound of Music fix! The final walk takes us around the craggy cliffs Gratlspitz (summit 1898m) which sits above Alpbach. We take a taxi to gain some height and then climb to a small mountain pass at 1800m. We then walk around the back of the mountain for views looking east. There are interesting Alpine flowers that change with the aspect of the mountain. We then come back into the Alpbach valley and descend back to the town. Today's 13-16 kilometre walk is expected to take approximately five hours with an ascent and descent of 500m. Drive to Munich Airport where the trip ends. The following excursions and/or activities are usually available and may be arranged locally. Estimated costs are provided below for guidance only, are on a per person basis unless shown otherwise, and may depend on the number of participants. Prices quoted arecorrect as of the date these trip notes were originally issued but may change at any time due to currency fluctuations. Innsbruck: allow €20 to travel there and back on the public bus. Achensee: allow €20 to travel there and back on the public bus. 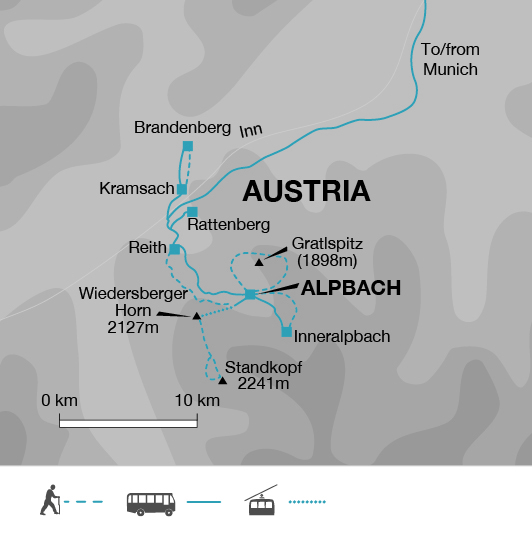 Salzburg: a private minibus can be hired from Alpbach. The price will vary according to how many people travel for this day trip. One main piece of baggage and a waterproof rucksack (30 litres recommended). Remember you are expected to carry your own luggage so don't overload yourself. One main piece of baggage and a waterproof ruck-sack. You just need to carry what you need for the day which will include a raincoat, waterproof trousers, jumper or fleece, wooly hat, camera, sun-cream, picnic etc. On hot days you will carry fewer clothes but more drinking water. Tap water is safe to drink in most places but water sources along the trail may not be reliable. We encourage our clients not to buy mineral water because of the negative environmental impact with plastic bottles. Energy snacks including chocolate and sweets are recommended whilst walking. Although entirely voluntary, tipping is a recognised part of life in this region of the world. Some local staff will look to members of the group for personal recognition of particular services provided. The cosy family-run hotel Muhlbachhof is just 3 minutes walk from the centre of the village. All rooms have balconies and are furnished in a traditional style. There is a reception area, a dining room where we take breakfast, reception and a small terrace with tables and chairs. There are 14 traditional Austrian-style bedrooms. Please note that twin bedded rooms in Austria feature 2 single mattresses, each with their own set of bedding, on one large bed base. If this style doesn't suit you then single rooms are available at extra cost. All rooms have a private bathroom and balcony. Dinner is included for 5 nights at a local family restaurant, which is 5 minutes walk from the hotel. They serve a fixed 3-course traditional Austrian dinner and will cater for vegetarians. Meals will be meat or fish based. Unfortunately other diets should not expect to be catered for. For the other 2 nights you can dine at other restaurants in the village. There are traditional Austrian restaurants, a pizzeria and a some 4-star hotel restaurants. You will need to buy your picnic each day; these can be bought cheaply at the local supermarket which is 5 minutes walk from the hotel. Austria: Visas are not required by UK, Australian, New Zealand, US and Canadian citizens. Germany: Visas are not required by UK, Australian, New Zealand, US and Canadian citizens. Other nationalities should consult the relevant consulate. 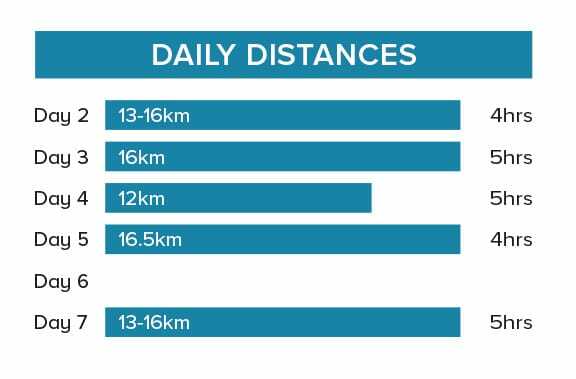 This is a 5-day trek with an average of 4 to 5 hours of walking a day. We have graded this trek as to easy to moderate. Immerse yourself in the Tyrolean lifestyle, staying at a traditional chalet with great hosts, in Alpbach -voted as Austria's prettiest village. There are numerous hand-built wooden chalets with wonderful flower-filled window boxes and a main street that rarely sees much traffic.The atmosphere is relaxed and friendly and almost everywhere you look there is a photo opportunity. Some men and women dress in the traditional dirndl and lederhosen and there are bands playing folk songs.